Note: Similar parameters exist for custom transformers. The title of the parameter changes depending on what is open on the canvas. For example, when a custom transformer is open, you will see Transformer Parameters instead of Workspace Parameters. Update the default name, if desired. We suggest a more descriptive title (for example: CAD-GIS: Converting text to attributes). The name is displayed on the title bar of the Workbench window. To rename a template, open it, then select File > Save As Template with the new name. You can password-protect workspaces, custom formats and custom transformers. Double-click the Password parameter and enter a case-sensitive password in the dialog that appears. Each time you try to open the workspace, you will be prompted for the password. If you save the workspace under a different name, the password protection will also be duplicated. Note: When you create a password-protected file, make sure you use a password that you can easily remember. If you lose the password, you cannot open or gain access to the file. Specify a category. You can use categories to organize or group related items when you upload to FME Hub. If a category contains transformers, the category name appears in the Transformer Gallery. Enter a description. The description is particularly important when you are using the workspace via an FME Server because it provides a mechanism for a web page to describe what the process is intended to carry out. The description you enter appears in the Description parameter with the proper encodings for spaces, formatting, etc. List any requirements that must be met before using the workspace or template, such as where the source data resides or minimum FME version required. You should also list any dependencies (for example, if you need a third-party application or an extra-cost transformer). Record any legal information (for example, copyrights or data restrictions). When checked, some rich text features of the dialog are not available. This box must be checked if you want to upload to FME Hub. Record changes made to the workspace. This is especially good practice if you are sharing data or workspaces. The History tab also displays the date and FME build on which the workspace was last saved. Specifies the behavior of the workspace if it contains transformers with <Rejected> output ports, and a translation outputs a feature to one of these ports. Terminate Translation: The translation terminates when the first feature is output to a <Rejected> port that does not connect to another input port. Continue Translation: The translation continues to run regardless of any features output to a <Rejected> port. An alternative way to set this parameter is to right-click on any <Rejected> port, and select Workspace: Rejected Feature Handling. If you set the parameter this way, the setting still applies to all <Rejected> ports in the workspace in the same way as setting it from the Navigator window. Note: To set the default behavior of this parameter for all newly-created workspaces, select Tools > FME Options > Translation. The Terminator transformer is used to detect non-valid situations. When a feature is directed to this transformer, the translation immediately stops and displays an error message (by default, Translation Terminated). If you are programming or debugging, you would usually disable the connections to the Terminator and then add an Inspector to verify if the features are real errors. In production mode, you then have to re-enable these connections and delete the Inspector. This option allows you to automatically redirect the features that enter the Terminator to an Inspector, without having to modify the workspace. When this option is activated, all the features that enter a Terminator are redirected to an Inspector and the translation continues without stopping. A message is added to the log file to indicate that some features were redirected to an Inspector. See Max Features to Log. See Max Logged Features to Record. The log file parameter points to the location where a log file will be created when the workspace translation is complete. Note: This setting overrides the global Save Log to File setting under FME Options > Translation. You can quickly reroute your output without having to add anything to your workspace. You might want to do this if you're having problems in your workspace, and want to examine features or information before writing to your original output file or folder. No Redirect: This is the same as keeping the <not set> default. Redirect to Inspection Application: View data in the default inspection application before writing to the output file or folder. Redirect to FFS File: This option is useful for debugging complex workspaces. The output is written to FME Feature Store files (FFS). The FFS files can then be viewed using the Inspector. Redirect to FFS can also be used to send database data to Safe Support. Since this option does not use the format writers configured in the workspace, it can be used to isolate problems that may be occurring in a specific FME format writer. Redirect from FFS file: Used for debugging complex workspaces. Output that has been created using Redirect to FFS file can be reloaded into the workspace using Redirect from FFS file. Disable Output: Instead of writing many features to a dataset, you might just want to see information or statistics gathered during processing. No features will be output. After you run the workspace, the log displays a message as a reminder that you have redirected your source or destination. Note: For detailed information on the FFS format, see the FME Feature Store (FFS) Reader/Writer chapter in the FME Readers and Writers manual. 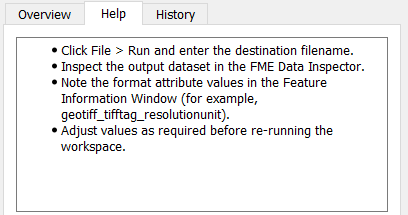 For help with the Data Inspector, open the Help menu in the FME Data Inspector application. See Startup and Shutdown Python Scripts. See Startup and Shutdown Tcl Scripts. Note: The following parameters appear when you open a custom format. Controls whether multiple datasets of a custom format are treated as a single set of features, or as separate sets of features. If Single Group is specified, features in all datasets are read and processed in the workspace as a single group. If Group By Dataset is specified, features are processed and grouped separately by dataset, similar to a GROUP BY clause in a database query. For example, if the custom format contains an Intersector transformer, features are only intersected against others in the same dataset. If Yes is specified, only files of the type that form the basis of a custom format are browsed. For example, if a CSV file is the basis for a custom format, then only CSV files are browsed by default. If Yes, readers are spatially enabled if a custom format's primary reader is spatially enabled. Spatial enabling, available in certain readers, allows optimized accessing of data in FME Objects applications, or when a bounding box is supplied when reading data. It is possible to create a custom format from a reader as a resource, which does not provide actual feature types. If the custom format provides features in the appropriate form for a dynamic writer, set this parameter to Yes. If No, the custom format is not treated as a dynamic workspace, and the features it provides are treated as actual feature types.